A twelve ounce bottle stamped with the date code 333 7 2 sold as a $2.99 single at my local store. I'm a fan of the smaller serving, but not the price when stores break them up and charge juice. Poured in a Lagunita's mason jar glass. Look- Pours a dark cola brown generating two fingers of frothy tan foam. A typical heady Lagunita's foam cap. It slowly settles revealing some thick lacing. Smell- Bakers chocolate, rye, whiskey and licorice. A little weak coffee emerges from the back. Taste- Whiskey, dark chocolate, char, spicy rye and oak. Feel- Thin and creamy with considerable alcohol heat. Overall- If I didn't read the label I would struggle guessing the base beer was a coffee stout. The barrel presence is front and center smothering any coffee in smell and taste. A solid dose of rye whiskey and oak make this a pretty much one dimensional beer. While still good, I much prefer High Westified. 12oz bottle, served in a tulip glass. Pours a dark black body, one and half finger thick offwhite head, good retention and lots of lacing. Smell is sweet whiskey, light smoke, touch of roasted barley, mild coffee astringency (not in the bad way), milk chocolate, touch of dark fruit. Definitely on the sweeter side. Flavour follows, although it seems to meld together a bit better with the coffee, barrel and base malts. A bit spicy, I suppose, but for the most part follows the flavour. Mouthfeel is thick, full bodied and creamy, nicely carbonated and smooth. Overall, a solid body to a big beer, but I would have liked the coffee to come out a bit more than it did here. Still a damn good value. A - Black colored pour with creamy thick toffee colored head. The top layer is very sticky and frothy. S - Coffee, bourbon, cream, char, dark chocolate, roasted malt. T - Coffee, dark roasted chocolate, bourbon, oak woodiness, and nice spiciness with moderate char. M - Big, full bodied, and rich textured. Very dry on the back of the tongue and wet in the front of the mouth. O - It's really impressive how well the ABV is hidden in this beer which lets all of the flavors blend really well and shine through. Really well done, Lagunitas! 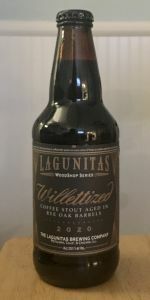 High crafted whisky meets imperial stout as Kentucky's Willett distillery partners up with California's Lagunitas for a taste of whisky spice, charred oak and the earthy grit of rye for balance, charm and intrigue. Willettized Imperial Stout pours an off black brown and burgundy, bleached slightly by the rye whisky barrels and taking on a dark coffee hue. As a light and creamy froth caps the beer, images of espresso and latte come to mind. The rugged scent of peppery grain, char and roast is smoothened with the scent of caramel and cream. Malty sweet on the early palate, the beer's strong taste of coffee is calmed with chocolate, walnut and nougat. While the middle palate becomes awash with the sweet roast of the stout, much of the same flavors transpires that started on the front of the tongue.- dark roast coffee, bittersweet chocolate, sweet caramel and cream all converge for a flavor of Kentucky's delectable bourbon ball candies. Whisky spice decorates the finish while nuances of peppery oak, husk, grain, and wood caramels add balance to the sweet char. Full bodied and creamy, the signature flavor of Willett rye whisky never backs down to the stout. Its own whisky spice and bold charred woods balance the sweetness of barley and trails into a bitter, gritty spice of pulled rustic grains, coffee and chocolate. Definitely noticed the heat earlier in this brew, as opposed to the High Westy version - less sweet as well. Coffee & barrel aroma right off the bat. Seems that the rye barrel gives it a spicier, perhaps also drier overall experience. Coffee is VERY present, even more so as it warms. Super tasty beer that will benefit from a few months in the cellar - if I can hold off that long! Poured into a Fremont small snifter. Pours a very dark mahogany brown, appearing opaque black in the glass with a thin brown head with good retention and thick lacing. Aroma of rich, dark toasted malt, coffee, chocolate and oaky vanilla, inviting. Flavor is also rich; dark toasted malt with mild char, rye whiskey, fresh coffee, mild dark chocolate and a little vanilla. Finishes with sturdy dark malt, chocolate, coffee and a little rye whiskey burn. Medium bodied with good light creaminess and mouth feel. After the last installment, I was expecting something great here, and Lagunitas delivered. This would be a fine stout even without the coffee and barrelling, thick and rich. However, the coffee is balanced beautifully with the malt and the rye whiskey gives it a spicy extra kick that is great. I was happy that the rye was not strong enough to add tartness to the stout, but the slight fruity nature of rye is present here. The ABV is visible, but seems appropriately in synch with the whiskey flavor. This is really a fine coffee stout. Shocker...another Lagunitas affordable homerun. These guys are the kings of outstanding, affordable beer. No competition. This is a big, bad stout that rivals CBS and other big bad stouts out there, but for half the price. Uber-smooth stout that gets smoother in my glass as each second ticks by. Creamy and delicious...pissed I only bought one bottle. Big and boozy, but not overpowering. Rye, vanilla, coffee, chocolate, and everything a big stout should have. Do yourself a favor and grab one or seven and thank me later. Don't overspend for BCBS or CBS if you see LWCS (yes, I just called it that) on the same shelf. Buy your significant other something nice with the money you save and you'll be a big winner. I'm out! 22oz bottled 11/5/18 (44 days ago Chicago) poured into a Spiegelau stout glass at fridge temp 12.9% ABV. The beer pours dense very dark brown with no highlights and abundant mocha colored head. The head slowly settles to a half inch cap and leaves a wall of lacing. The aroma reveals oak, rye whiskey, vanilla and coffee. The taste is semisweet caramel and roasted malt with oak, vanilla, rye, coffee all intermingled throughout each sip. The mouthfeel is full bodied with just less than medium carbonation and an oak and rye dominant semidry finish. Not noticeably bitter and one would never guess the ABV from the aroma or taste. Overall, excellent. I've missed this every year until now due to the slightly higher priced bombers hanging out on shelves just a bit longer. This puts many other high priced offerings to shame. Coffee is very subtle would be the only detractor. Recommended. A: Jet black with 3/4" tan head and sticky lacing. S: Whiskey, chocolate, char, malt, and coffee. T: Follows the nose, very forward whiskey with a nice coffee hit, sweet chocolate and malt with some minor char. M: Medium feel and minor bite on finish. O: This is a fantastic beer, flavors are amazing and well worth the wait. Cocao, dark chocolate, milk chocolate, espresso, vanilla and oak. Medium bodied. Not bursting with flavor but well rounded. Semi dry, slightly bitter finish. Pretty good. Just finishing up a chilled bomber of this wonderful dark brew . Lagunitas just seems to do most everything right at a very affordable price . Been sipping this one slowly while watching my fantasy QB Mahomie ;) today against the Colts . Thick black pour with almost no head . Wonderful glass of lacing . Smell is nothing overpowering but nice . Overall just another outstanding offering . I liked the Hi West aged coffee stout offering more two years ago , but I’m still happy with my multi bottle purchase !! CHEERS PROST AND ENJOY NFL PLAYOFF WEEKEND !!!! This one's all up in your face with a huge flavor profile, coffee crush and then ABV hit. But it's extremely balanced and smooth. With a 10% off coupon, I got three six-packs for $12.60 each and I left the store running like I stole something. I have no idea how Lagunitas is able to sell this at the price it does, but take advantage if you can. Poured Willettized into a snifter. A - Pours black with brown highlights around the edges. S - Carmel, toffee, vanilla, sugar, faint coffee if any. T - Vanilla, toffee, carmel, char, licorice, bourbon and rye, some coffee, roasted malts, alcohol on the finish. M - Smooth and thick with low carbonation. O - Damn good coffee stout and considering the price a value pick! Cheers! F -- Fluffy, moderately silky mouthfeel. Medium carb. Nice and drinkable for the ABV. The look was dark black with a small tan head. The aroma was lots of coffee on the nose then some rye. The taste was coffee and roasty malt with the rye flavor finishing off. It was a little more bitter then I expected it to be. The mouthfeel was a little thin. Overall this was a good beer with a really good price point for a barrel aged beer.